The vision for this initiative is to engage citizens to clean up, beautify and improve our city which will enhance our neighborhoods, quality of life and livability of our community. It has been a continuing goal to improve the appearance of our community. A community’s appearance plays a large role in how visitors, perspective new businesses and citizens view a community and affects their decision on moving to Cushing. The city government cannot accomplish this goal without community participation and pride. The city, along with several community representatives, have been working on a program, “Cushing Pride”, to improve the appearance of Cushing and build stronger neighborhoods. The success and sustainability of this program is centered on community and neighborhood volunteers, #VolunteersMakeItHappen. Please preregister online HERE so that ample supplies can be available. Each new volunteer will receive a free “CUSHING PRIDE” tee shirt designed by the High School graphic arts class and sponsored by GRDA and the City of Cushing. Mr. Richard Thackray, our lead volunteer director for Cushing Pride, accepted a new custom neighborhood Adopt-a-Block street sign. 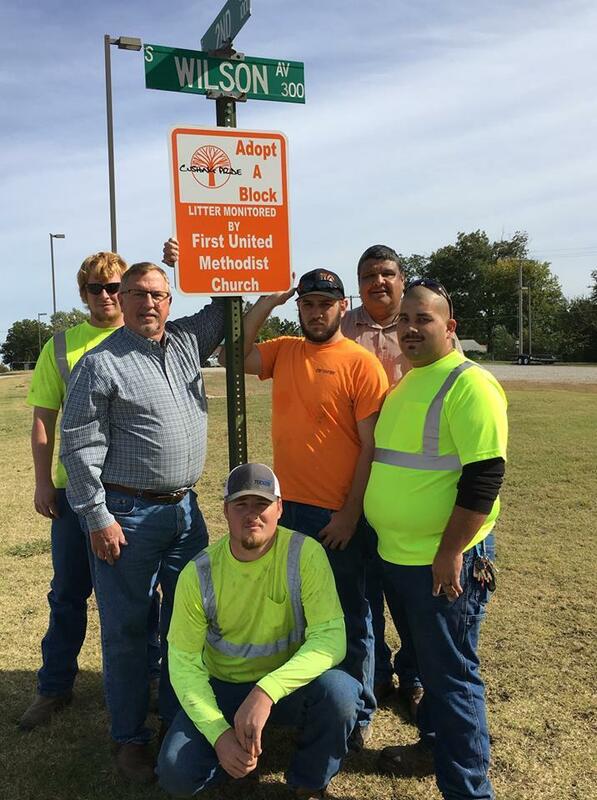 The Adopt-a-Block program is just one new offering by Cushing Pride and the signs will be used to identify areas that are being cared for by various churches or other organizations. Under the leadership of Mr. Brent Youngman, our Street Services Director, the sign was created by team member Ricky Johnson. "Having this type of talent on our team allows us to keep projects like this, among others, in-house which in turn yields a significant cost savings for the people of Cushing," Youngman said. Mr. Thackray was presented the sign this afternoon by members of our Street Services team in a neighborhood so he could see how the sign will look when posted. This is just another example of EVERYDAY people making a difference right here at home. Please be sure and checkout the Cushing Pride Facebook page for more information on what is happening inside Cushing Pride. The vision of Cushing Pride is a solution to a probelm. I hope you ask how you can plug-in and be a difference maker. On behalf of Chairman Don Amon and the Board of Commissioners, thanks to Mr. Thackray, co-leader Vic Caudle and the army of volunteers for making a difference right here in Cushing by serving in Cushing Pride! The following link will take you to the Facebook photo album of the Cushing Pride #VolunteersMakeItHappen events. The City of Cushing, Grand River Dam Authority (GRDA) and the American Public Power Association (APPA) teamed up to beautify City Hall and the transfer station by adding seven (7) mature Red Bud trees. GRDA was awarded a “Tree Power” grant from APPA to purchase the trees on behalf of the City of Cushing. The City was selected by GRDA due to the community’s effort to help clean up our community through the Cushing Pride initiative. GRDA sells power to the City along with sixteen other municipalities. Trees are good for the environment, provide shade, wind breaks, beauty and they enhance our quality of life. The tree planting ceremony included GRDA employees, City Commission and City employees along with some of our local high school students involved with Cushing Pride. This is just another example of improving our city. Come join us in the next Cushing Pride event and be a part of building community together.